Note: Samoan Independence is celebrated June 1. I am posting this at 9:14 p.m. 1 June Auckland time... which is 10:14 p.m. 31 May Samoa Time. Apologies for any resulting confusion. I’d already made plane reservations when I learned that my trip coincided with Samoan Independ- ence Day. And just as the 4th of July is a big deal in The States, Independence Day is a big deal in Samoa. There’s a big parade and boat races and lots of other festivities. All of the staff at my school received yards of material so we could all wear coordinated outfits in the Independence Day parade. So I felt a little guilty about being out of the country. 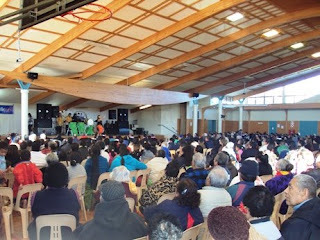 And then I typed last night’s sophomoric post, only to receive NiuSila’s warm comments inviting me out to the Samoan Independence celebration in Mangere East. If there’s any way to motivate me to do something, guilt is going to be your strongest method. And when guilt strikes twice, I’m a pushover. So I woke up this morning and looked up bus routes to get down to Mangere East. I skimmed the route, spent a little time studying the map, and then headed out the door. The cell phone I use in Apia is completely non-functional here in Auckland. I could have invested in some sort of pre-paid SIM card plan, but it never seemed all that necessary. That said, I realized today that my sense of urban literacy is largely based on having my iPhone at my side. True, I’d only had my iPhone in The States for about 15 months before I left to join the Peace Corps, but the thing was so life-changing, it’s nearly corrupted my ability to function. I should have written down the number of the bus and the cross street for where I was supposed to get off. I was vaguely aware of where to catch the bus and I knew it left hourly, 36 minutes after each hour. But as I boarded, I realized I was relatively uninformed. 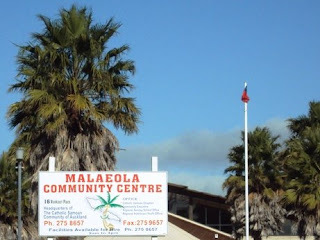 To make a long story short, I wandered around Mangere for about a half hour before I found the Malaeola Samoan Catholic Community Centre. The parking lot was teeming with cars, and I could see tents in the distance. It was standing room only when I got inside the assembly hall. There was a group of guys on stage doing a slap dance. It was a strange feeling. On one hand, New Zealand is far less exotic than Samoa; it has big city buildings and everybody speaks English. Yet in this sea of strangers in which I’ve spent the last 8 days, it felt good to be in a place where the dance and culture and food were familiar. There was palusami and pua’a out in the food tents. There were people walking around with lavalavas over their jeans. In a way, the event was pretty much Apia with jackets. On the other hand, I was a little nervous about the whole thing. Being the only Peace Corps with a bunch of Samoans in Samoa is one thing, being a solo outsider with a bunch of Samoans in South Auckland is completely different. I found myself making assumptions about social situations based on my experiences the past 7 months, and I realize a lot of that wasn’t necessarily applicable to the people here. So I was polite, and I kept a low profile. It was fun to use my language skill, albeit minimally. Exiting the auditorium I had to squeeze past some old men, and I threw out some tulous. And walking around food tents, I gave a lady a Malo!, and she threw it right back at me. In the end, I was happy I made the pilgrimage down south. It was interesting, and I can say I celebrated Samoan Independence. And I was still able to fit in a trip to Starbucks. I hope you had a great weekend. Pictures below. A girl performs onstage as a packed audience watches. 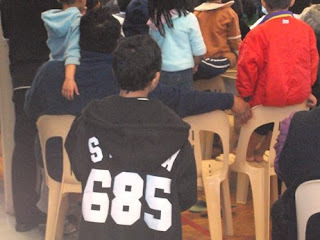 A Kiwi kid sporting the 685, Samoa's country code. 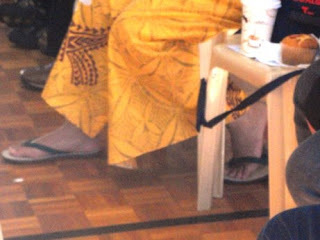 A lady in the crowd keeping it real with a pair of Jandals and a lavalava. 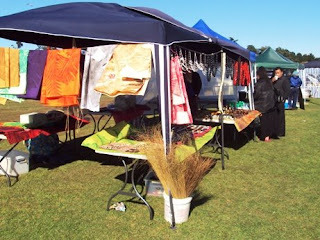 Tents outside hawking authentic Samoan goods. 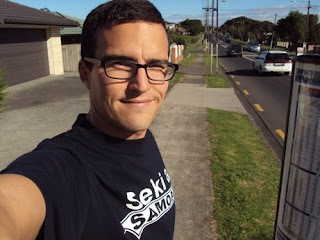 Me at the bus stop near Tidal St., sporting my Seki a Samoa t-shirt. That was awesome cool of you to go Matt. It aint the village but kinda. I commend you just for going to Mangere...just joking its not as bad as people like to make it out to be....I'm a product of the suburb and I dont think I turned out too bad. I'm happy someone enjoyed Samoa's Independence celebrations in New Zealand. I think I've been to too many of the celebrations at the Malaeola that it has become monotonous (to say the least). Faafetai tele lava. Ia manuia. "Heads Up Seven Up" Anyone?